Zandhessami, H., Jalili, A. (2013). The Impact of Total Quality Management on Organizational Innovation. 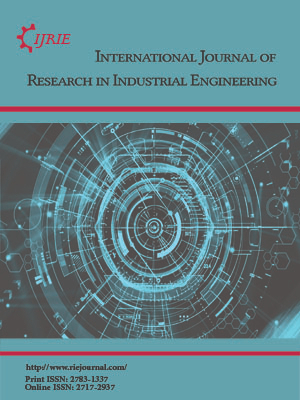 International Journal of Research in Industrial Engineering, 2(1), 1-11. H. Zandhessami; A. Jalili. "The Impact of Total Quality Management on Organizational Innovation". International Journal of Research in Industrial Engineering, 2, 1, 2013, 1-11. Zandhessami, H., Jalili, A. (2013). 'The Impact of Total Quality Management on Organizational Innovation', International Journal of Research in Industrial Engineering, 2(1), pp. 1-11. Zandhessami, H., Jalili, A. The Impact of Total Quality Management on Organizational Innovation. International Journal of Research in Industrial Engineering, 2013; 2(1): 1-11. Department of Industrial Management, Islamic Azad University, Qazvin branch, Qazvin, Iran. Many organizations are facing competitive challenges due to the rapid pace of technological change. Management theorists and practitioners alike have called for more creativity and innovation in product lines, management practices and production processes. On one hand, Total quality management (TQM) has long been a major management practice. Recognition of TQM as a competitive advantage is widespread around the world, and few companies can afford to ignore TQM. Therefore the purpose of this paper is to identify and extraction TQM & Innovation dimensions. In first part have been recognized four dimensions for TQM and two dimensions of Innovation, The four TQM dimensions in this study include Leadership, Employee relations, Customer focus , Continuous improvement and the two Innovation dimensions are Product innovation and Process innovation. Also, in this paper used a DEMATEL Method to examining the causal relations these factors. Inattention to results, the most influential factor is Leadership and more affected factor is Process innovation. As a result Leadership has more influence on Innovation.